While Zind-Humbrecht’s Rieslings and Gewürztraminers from the estate’s prime Clos Saint Urbain parcel within the Grand Cru Rangen frequently number among Alsace’s top bottlings, it is their Pinot Gris that reaches the greatest heights of winedom. In my view, the family’s Pinot Gris Rangen de Thann Clos Saint Urbain is the world’s greatest dry Pinot Gris. Domaine Zind-Humbrecht is one of the world’s most famous white wine estates, producing a bevy of world-class bottlings that have very few peers in their respective categories. The Humbrecht family owns 40 hectares distributed among five Grand Crus and several other sites, but even their non-Grand Cru holdings, such as the Clos Windsbuhl, are among the best vineyards of Alsace. The most important of their vineyard holdings is their 5.5 hectares walled monopole Clos Saint Urbain within the Grand Cru Rangen. The Clos takes its name from the small 15th century chapel located in the middle of the vineyard, which is dedicated to Saint Urbain, saint patron of vine-growers. Léonard Humbrecht, who married Geneviève Zind and founded the Zind-Humbrecht estate in 1959, bought the first 3.5 hectares in 1977 (the oldest vines in the Clos were planted in 1963), then added another two hectares between 1978 and 1986. As is often the case in Alsace, where Grand Crus tend to be (too) large and multiple grape varieties are grown within their boundaries, Zind-Humbrecht farms Riesling, Gewürztraminer and Pinot Gris in the Clos Saint Urbain. While their Rieslings and Gewürzes are frequently exceptional, it is the estate’s Pinot Gris that remains unequalled elsewhere. The Rangen is arguably Alsace’s best – or, at the very least, most distinctive – Grand Cru. It is the southernmost of Alsace’s 51 Grand Crus, overlooking the village of Thann, and has been linked to the production of exceptional wines through the centuries. According to documents from the Abbey of Murbach, the entire Rangen was planted to vineyards as early as 1272, although there were almost certainly vines grown in the Rangen well before that. In 1291, the Dominican convent of Basle purchased 16 hectares there; the following year, the convent of St. Ursitz in Einsiden and the Cistercian abbey in Haute-Seille also bought vineyards in the Rangen, and “Rangenwine” has been famous ever since. The church of Saint Théobold (Saint-Thiébault) in nearby Thann also attracted pilgrims from all over Europe, which further helped the wines gain in popularity. Thann itself was a bustling, wealthy town (in 1659, 20 of its 1,150 inhabitants were vignerons), even named an “imperial city” at the time of the Austro-Hungarian Empire. Just under 19 hectares in surface, the Rangen faces south, its vineyards planted between 330 and 480 meters (1,083-1,575 feet) above sea level on very dark volcanic soil, a mix of greywacke (fine sedimentary sandstone and volcanic elements), andesite (fine-grained volcanic rock), tufa ash and various other lava-based angular volcanic rocks that are strewn all over the vineyard. With a pH ranging from 5.5 to 6.5, the Rangen’s is a very acid, nutrient-deficient soil in which most plants have difficulty growing. It is also potentially one of the warmest Grand Crus in all of Alsace, thanks to its dark heat-retaining soil and to its steep southern exposure, which maximizes direct sunlight on the vines. Fortunately, the Rangen’s higher altitude and the presence of chilly winds blowing down the valley from the north help to create a cooling effect and hence a microclimate that is actually less hot than might be expected given the cru’s topography and geology. 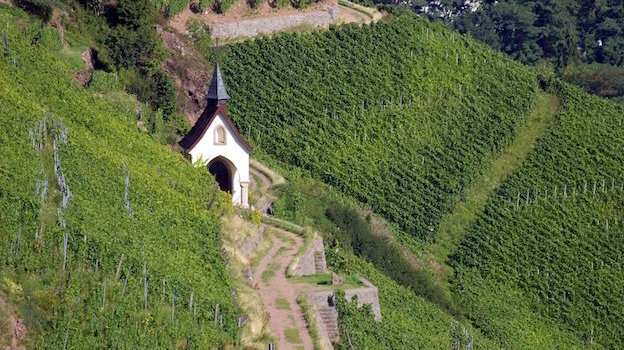 In fact, the Rangen is an incredibly steep site, and therefore terraced—just standing and walking about in the Rangen, never mind picking grapes, is next to impossible. Olivier Humbrecht, who took over running the Domaine from his father Léonard in 1989, likes to joke that even his horse Nikita stubbornly refuses to climb up the Rangen, not surprisingly being much more amenable to going down the slope instead. The Domaine was certified organic by Ecocert in 1998. In 2002, as a member of the Biodyvin group, Domaine Zind-Humbrecht was certified for biodynamic viticulture. Since the vineyard is so steep, it follows that the Rangen enjoys excellent drainage, but this also means that drought years and water stress can be problematic, especially for young vines. Although budbreak occurs later here than in other Alsace Grand Crus, the warm summer allows the vines to catch up, and typically very ripe grapes are harvested in the Rangen. The proximity of the Vosges Mountains, higher-than-average rainfall for the region (about 750 millimeters per year) and the higher altitude of the site compared to other Grand Crus in Alsace (as the Rhine flows from the center of Europe toward the North Sea, it is Alsace’s southernmost vineyards that are located at highest altitude) all contribute to the late-ripening nature of the Rangen vineyard. Depending on the characteristics of the particular growing season, the harvest in the Rangen normally occurs in October but sometimes extends into November. Other factors also contribute to the complexity and distinct personality of the Rangen’s wines. The Thur river runs immediately below the Rangen hill, and it helps moderate the climate, protecting the vines from spring frosts and facilitating the formation of noble rot in autumn. The presence of at-times copious Botrytis cinerea and the late harvest dates explain why both dry and sweet late-harvest wines (Vendanges Tardives or Séléctions de Grains Nobles) can be made in the Rangen, depending of course on the year’s weather patterns. It is the Rangen’s unique terroir that explains the personality of its wines, which typically offer a heady mix of power and pungency. Terroir also explains the unique quality of its Pinot Gris wines, a variety that generally prefers limestone-dominated soils to volcanic ones. However, Pinot Gris, an earlier-ripening variety than Riesling, benefits greatly from the later harvest in the Rangen, the presence of noble rot, and the very low yields typical of this Grand Cru (normally less than 30 hectoliters per hectare but sometimes, as in vintages like 2010 and 2012, as low as 15 to 25). The result is Pinot Gris wines of mesmerizing purity, depth and complexity. By contrast, on more fertile alluvial soils, at yields of 80 hectoliters per hectare or higher, production levels that are common to many other wine-production areas, within Alsace and elsewhere, it’s hardly surprising that much of the world’s Pinot Grigio and Pinot Gris wines lack depth and nuance. Rangen Pinot Gris wines are also characterized by their noteworthy tannic element and aging potential. Importantly, the acidity of Pinot Gris in the Rangen is often concentrated in late summer and early fall; it dehydrates very easily on the vine, and when such grapes are also hit by noble rot, the resulting combination of luscious honeyed sweetness, truffle and mushroom notes, and refined smoky, spicy nuances is unique in the world of wine. And although aromas and flavors of peach, dried apricot, quince jelly and beeswax are most typical of the Rangen’s sweet wines from Pinot Gris, to a certain extent they are found in the dry versions as well. Furthermore, thanks to the high mineral content of the soil, Rangen Pinot Gris is characterized by typical strong saline quality, notes of peat, flint and. All of these characteristics add up to what is one of the world’s richest, most complex white wines, equal in quality to the greatest white Burgundies. I tasted the wines reviewed in this article with Olivier Humbrecht in Italy this past April. Although Humbrecht would have liked to include some Vendange Tardive wines he made in the same vintages, I asked that we limit the tasting to the drier wines only (though many carry hefty doses of residual sugar) so as to maintain a common thread and stylistic bent throughout the vertical (of course, I told him I’d be more than happy to write up another vertical of the Rangen’s sweet wines sometime soon!). I should note that the 1983 wine carries the words Vendange Tardive on the label, even though it’s a completely dry wine. At that time, most producers used the term quite freely, Alsace wine law allowing this as long as the grapes had reached the required level of maturity and sugar concentration – despite not having been picked late in the season, as, in my opinion, a true Vendange Tardive wine should always be. We tasted wines made between 1983 and 2013. 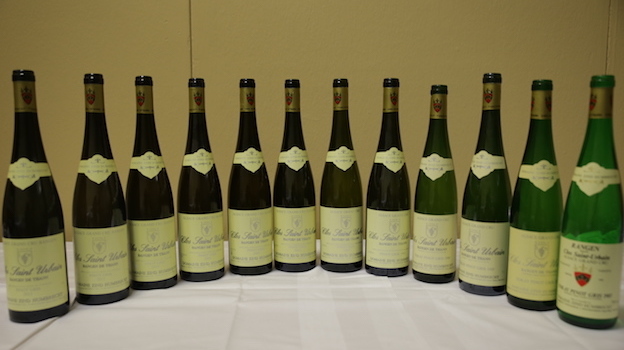 According to Humbrecht, the earliest vintages (1978 was the first) were mainly exercises in getting to know the Rangen’s terroir: having been long abandoned, the Rangen needed to be replanted and nurtured again, and the wines from the 1978, 1979 and 1980 vintages, he maintained, were less than memorable. The 1981 was the first Rangen to deliver on the potential of the site; the 1982, a year of generous production, was too diluted; and the 1983 was the first wine to showcase all that Pinot Gris and the Rangen are capable of. Still, numerous winemaking changes have taken place at this estate since 1983. In 1986, Léonard Humbrecht switched to longer maceration times and whole-cluster pressing (for 15 to 20 hours). 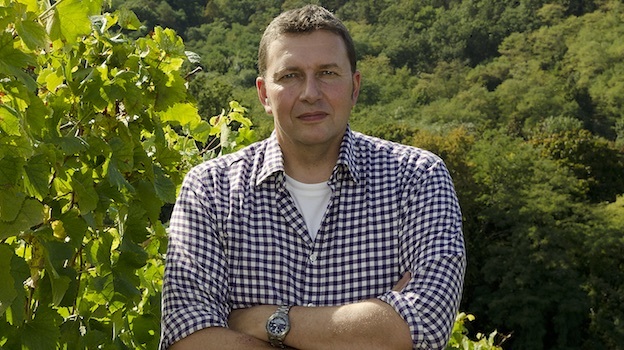 Beginning in 2005, Olivier Humbrecht began bottling his wines later, after at least a year on their lees, and as of 2014 he has further extended élevage, to as much as 18 months.